When Jesus appeared to the disciples, they were utterly transformed. The fact that Jesus was alive made a massive difference. I think there are seven transformations in this passage that reveal what happens when people meet the risen Jesus. Seven things that would not have happened, and cannot happen today, if Jesus had remained dead. If we were to ask many Christians what difference the resurrection makes, my guess is that the answer would be about the comfort of knowing that Jesus is alive: we can talk to Him; He has promised to never leave us. But, I am not sure that is how John described the impact for himself and the other disciples. On that first night, the doors were locked for fear of the Jewish leaders. The disciples were terrified. The authorities had arrested and killed their leader. The body was missing. Would soldiers be out searching for it and for them? Mary Magdalene claimed to have seen Jesus. What did all this mean? What would happen next? They were in hiding. Admittedly, the next Sunday the doors were again locked. T doesn’t say why. Presumably they were still scared. OK so they didn’t get it straight away. We are sometimes a bit slow too. But Jesus wanted them to have the peace that only the resurrection provides. When you know that God is sovereign; God is working His purposes out, then you can have peace. If Jesus had been killed and had remained dead, it would not have been obvious that God was in control. Satan would have won. The circumstances looked terrible but the resurrection showed that God was in control. And there was peace. The resurrection showed the terrified disciples that death was defeated. And there was peace. They had seen the empty tomb – and not understood what was going on. They had heard Mary’s testimony – and doubted her. But now they saw Jesus and they believed. It is only implied on that first Sunday. It is much more explicit in the story of doubting Thomas. The disciples had told him of their encounter with Jesus but he was stubborn. He refused to believe without proof. 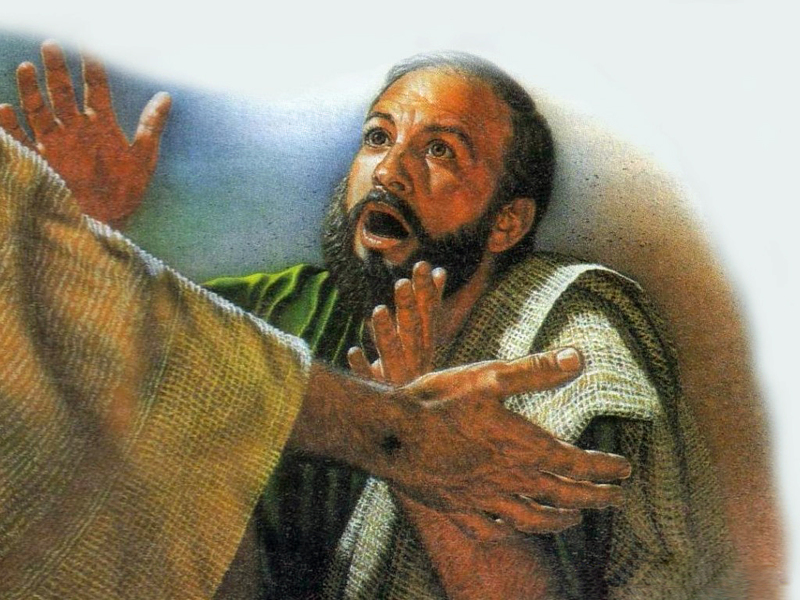 But, on that second Sunday, when Jesus appeared, and gave him the opportunity to put his finger in the nail holes in His hands and his hand into the spear wound in His side, Thomas believed. Despite what he had said, maybe he didn’t even need to touch Jesus’ wounds. Just encountering Jesus was enough for him to declare: “My Lord and my God.” Refusal to believe turned into faith. The passage says that they were overjoyed. Is that like a United Airlines plane being overbooked, or a city being over-populated? Did they have too much joy? Can you have too much joy? Can we imagine what this encounter was like for them – the relief, the excitement, the celebrations, the jumping up and down? The resurrection made all the difference. The disciples were locked in a room with no sense of purpose or knowing what their live was about now. There was no hope. But the risen Jesus gave them a mission. “I am sending you.” Suddenly they had a calling, significance, a task. They were still part of God’s plan. Many Christians focus on the comfort and ignore the commission even though it is the commission that gives us purpose and meaning. Ignoring it is disobedience because the risen Lord sends us. We have a job to do. What is that mission? It is slightly puzzling that the disciples were told that they could forgive sins. Surely only God can forgive sins. But they were to bring forgiveness by sharing the gospel: Jesus Christ dies for our sins and rose again. And they could assure all who believed that they were forgiven. We don’t have just a mission as if we all have different missions. We have the mission of proclaiming forgiveness of sins through the gospel of Jesus Christ. How could the disciples possibly fulfil this mission? They were a tiny group of fishermen and similar with no authority, no resources, no means… until Jesus breathed on them and said, “Receive the Holy Spirit.” Whatever He calls us to do He also empowers us to do. When Thomas suddenly believed, his natural response was to declare his relationship with Jesus. Jesus was his Lord and his God. He, like the other disciples, had had a relationship with Jesus but when Jesus died that relationship ended. Only with the resurrection was that relationship restored and taken to a whole new level. Those two words, “Lord” and “God” described the new relationship. A lord is someone from whom you take orders. By calling Jesus “Lord” Thomas submitted Himself to Jesus’ lordship. The other disciples had come to the same conclusion. V.25 says that they had said to Thomas “We have seen the Lord.” Jesus had been their leader and teacher – clearly the One who called the shots – prior to His death. How much more this risen, vindicated, victorious, death-defeating, eternal Son of God. This was a relationship of submission and obedience. And secondly, “You are my God” means (before anything else) “I will worship You”. The seventh transformation is seen in John’s conclusion to this section. John had recorded a number of miracles. The greatest of them all was the resurrection. Why had he told of these things? So that we might believe that Jesus is the Messiah, the Son of God, and so, have life in Jesus’ name. I suspect the disciples would all have said that that was true for them; that it was in that meeting with Jesus that they received the abundant life and the eternal life that Jesus had promised. Look at those seven transformations. Every one of them is life-changing. All of the results of the resurrection are good: peace, faith, joy, mission, power, relationship, life. But, are there any there that you would like more of? Maybe some are strong in your life but are there others where the transformation has not yet taken place? In some areas maybe the door is still locked. The growth is slower. What can you do about that? How did the disciples position themselves for this transformation? What did they do that they might experience more of the living Jesus? The most obvious thing is that they did very little. They were huddled in a locked room with no expectation that Jesus would turn up. It was Jesus who took the initiative. It was the grace of God that brought them to this point – the generosity of God. It always is. But clearly Jesus wanted them to know that He was alive. He took the initiative so that they could. Jesus still wants to reveal Himself. He will make Himself known. It is apparent too that other people’s testimony had little effect. Mary Magdalene had said that the tomb was empty, Peter and John saw that the tomb was empty – and didn’t understand it. Mary later said that she had seen the Lord. But it was when the disciples met Jesus themselves that they were transformed. They told Thomas that they had seen the Lord but he still didn’t believe until he saw Jesus Himself. Other people’s experience is not enough. We need to have met Jesus ourselves. But those testimonies did point them in the right direction. The testimonies prepared the way. Jesus had told Mary to tell the disciples. The disciples were commissioned to go and tell. We need to listen to people who have experienced Jesus but we also need to seek our own experience. Thomas was resistant but at least he was open to believing, if he could be convinced. And, at least, he continued hanging out with the disciples. In some small way, he positioned himself to also meet Jesus. Lastly, we do have the scriptures – the record of God’s actions – which, John says, can lead us to believe in Jesus and to receiving life in His name. Do not dismiss the testimony of others. What they have experienced, you also can. Read the Bible. Explore, Investigate. This passage doesn’t say it but I think it is obvious: pray. God promises to reveal Himself to those who seek Him with all their heart. This entry was posted in Easter, Uncategorized and tagged faith, joy, life, mission, peace, power, relationship, resurrection, Transformation. Bookmark the permalink.